This is The Guilford Bed and Breakfast. Built around 1905-08, this gorgeous home several years ago underwent an interior restoration, but the exterior was never restored back to its original splendor using a three color exterior traditional "painted lady" appropriate of the era. Until now. The owners began a full exterior renovation last summer but with the level of detail they set out to achieve, they were only able to get two sides of the home painted before winter. Starting back up this spring, they completed the last two sides. But this restoration wasn't just about the paint colors. it was artistry. The dormer window accent railings have hand turned spindles and copper caps; the vent pipes are copper clad as are the chimney flashings (and both chimneys were fully rebuilt). 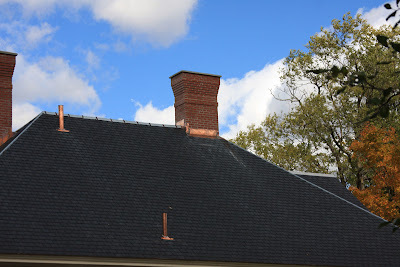 The roof is the original Monson Slate and looks like it was just installed. The porch screens were all replaced and custom plexi-glass panels will replace the screens in the cooler months. When the floor boards on the front porch (with the curved entry and columns) were removed for replacement, rotted wood was discovered and replaced. But the owners went one step further: the porch skirt was comprised of individual vertical hand cut decorative pieces, and most of us would simply purchase lattice from our local hardware store. But not here. A craftsman hand cut several hundred of these pieces and mounted each to a board to then fasten beneath the porch. This was not simply replacing rotted wood with what's available today, this was restoring it to its original style. There is a big difference between a renovation and a historic restoration. The Guilford Bed and Breakfast is a spectacular example of restoring the beauty of yesteryear. Not all of us have what it takes to do this and we should appreciate those who do. This grand Victorian is offered at $650,000 and should be maintenance free for years to come.